The man at the corner tabac turned the pages of a notebook before he looked up at our anxious faces. "I don't have enough," he said. Our hearts dropped to our stomachs. We were counting on the tabac by the immigration office having the tax stamps we needed to get Earl's visa. His appointment started in less than an hour, and his temporary visa expired today. Would this mistake cost us our "Amazing Race" to spend a year in France? Today was the day that Earl had his appointment with the French immigration office. It should have been no problem. I went through it two weeks ago. We knew what to do. One thing that tripped us up at my appointment was buying tax stamps. Our friend told us to go to any tabac (that's just a tobacco store that also sells coffee and lottery tickets and various other items) and buy the stamps. For my appointment, we went to a tabac in Aix en Provence, but the woman gave us a paper with an electronic stamp printed on it. When we gave the immigration office woman the paper with the electronic stamps, she sadly shook her head. We needed physical stamps. 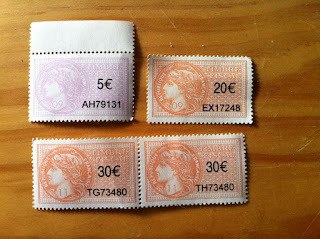 So Earl ran to the tabac on the corner near the immigration office in Marseille and purchased the 250 Euros worth of stamps allowing me to complete my Visa. As we prepared for Earl's appointment, I leaned toward waiting until we arrived in Marseille at the immigration office. We knew the tabac had the stamps, it was right on the corner, and we didn't risk getting the wrong thing. We stopped at one tabac here in Aix en Provence to ask, but they didn't have the stamps. "Let's just wait,"I convinced Earl. After waking up in the blackness of the early morning, we left the apartment at 6 walking down the darkened Cours Mirabeau as vendors began to set up their booths, emptying large white vans and unfolding tables. We caught the 6:30 bus to Marseille, arriving at 7 before we descended to the Metro and exited on the street of the immigration office. The route was familiar. We didn't hurry. All we had to do was buy the stamps, and we had all the other papers in order. 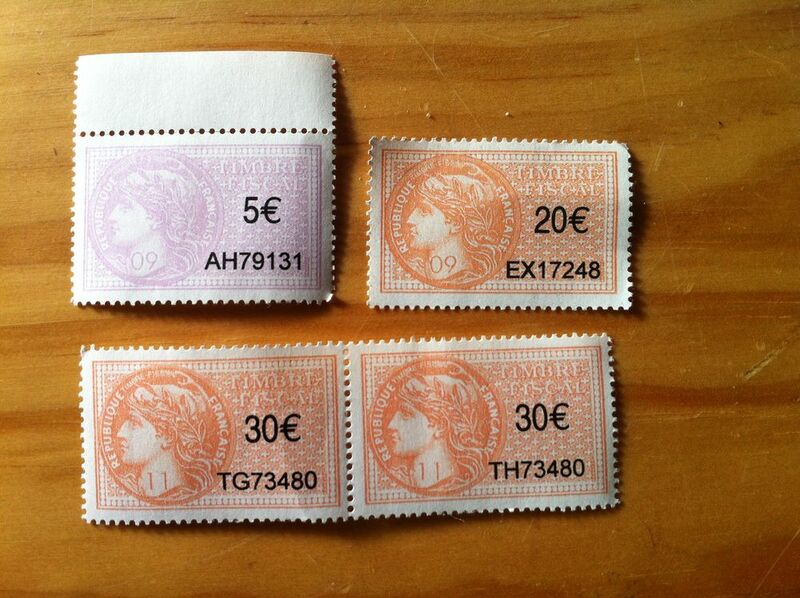 When the man in the tabac told us he didn't have enough stamps, I asked him where else we could go. He pointed to the left and said take the third street to the left. We scurried down a street, stopping at a couple of other tabac shops. The people behind the counter generally gave us strange looks as I asked for "les timbres des taxes." I didn't know what else to call them, but they all shook their heads and sent us on our way. Of course, they suggested places in French, and I was in a tizzy, unable to understand what they said or to take the time to ask for clarification. One woman suggested something that sounded like "ampoules" and motioned down the street. I searched the buildings for a sign that might say "ampoules" which I later found out means bulbs, so it wasn't the correct thing. After about five tabacs, following the map on Earl's phone, I suggested he go back to the immigration office for his appointment. He would need to have a chest xray, meet with the nurse and the doctor before he would need the stamps. I would arrive at immigration before he needed the stamps - I promised him. He gave me a kiss and the 250 Euros to buy the stamps. He also handed me his phone since it is the one with French service. I could use it for directions. The last tabac we had asked at pointed down the street and said "vingt-deux." Twenty-two? I wondered. But the phone was directing me toward another tabac so I decided to follow that. I walked about three blocks in the opposite direction before I turned back, heading toward the direction the woman had pointed. That's when I saw a sign for the City of Marseille Prado office. Maybe someone in city government would be able to help me. The building with the sign said the office had been moved down the street, so I hurried to the new office, which was closed until 8:30. Next door was a hotel, so, just like on The Amazing Race, I decided to consult with the hotel concierge. The man buzzed me into the building and told me he spoke English. What a relief! I explained what I was looking for and he looked me in the eye and said, "Ma'am, I am a hotel." If I hadn't been so desperate, I would have laughed. "I know you're a hotel. I thought you might know where I can look." He read the letter that explained what I needed. "It says you can buy it online," he said. "The woman at the immigration office wouldn't accept an electronic stamp," I explained. "We need actual, physical stamps." He went on a brief tangent, suggesting that we deal with someone else in the office, but I just wanted to find the right kind of stamps so Earl could get his visa. "When I need stamps, I go to the tabac to the right of the white church in the old port," he said. We were miles from the old port but I nodded my head. "Could you call and ask them?" "I don't have the number there, ma'am," he said. 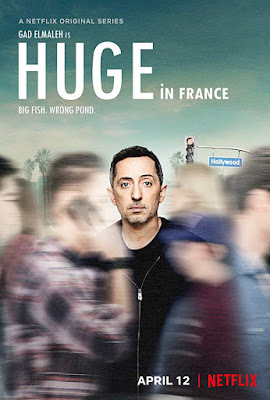 Now, if I were pushy, like the contestants on The Amazing Race, I would have offered to look up the numbers if he would just do the French speaking, but I didn't. "Do you think the city office next door will know?" I asked him. "Have them write it down then come back to me and I'll explain it," he said. I waited for the office to open and got in the building second, in front of another couple who were distracted by a phone call. There were no numbers to pull from the ticket machine, but I stood, shifting from foot to foot. The man in front of me was there for his passport and he got called to a worker right away. The other workers didn't seem to eager to start their day. They compared papers and plugged in printers, exchanging cheek kisses as they greeted one another. Finally, a woman called out for the next person. She looked at me like I was crazy too. She said a word that I didn't understand. "Will you write it down?" I asked. "Impots" is what she wrote, followed by "Bar Tabac." Yes, I knew about the tabac already. I ran back to the concierge. "Of course, des impots," he said. Down the street, turn right past the tabac, past a restaurant called Bozen, and there was the office. The office said "Centre de Finance Publique." I marched up the walkway and saw a notice on the door that they did not have "timbres fiscaux." Damn. That's what I needed. The man inside the door waiting to direct people to lines looked at me. I entered and asked where I could find "timbres fiscaux." "Vingt-deux," he said pointing to the right. "Vingt-deux?" I repeated. And he nodded. So I raced back out to the street. I just needed to go to number 22 on this busy four-lane street. I looked at the first building on my right -- number 179! Oh, no. The numbers aren't the way they are in the U.S. where one block might be the 100s and the next block would be the 200s. Nope. One block was the 170s, and the next one was the 160s. I don't know how far I walked before I finally reached 24, which seemed like a much better bet than 22, which was a clothing shop. Number 24 had a big entrance with several buildings inside with other numbers on them. I hesitated and perused the map before I let out a decidedly French sound like a raspberry. The woman beside me laughed, equally perplexed by the maze of numbers and buildings. I asked in the next building, but that was a phone company. The concierge at building 24 was missing. I couldn't wait. I had to hurry. Maybe I misunderstood the man. Maybe he said "cent vingt-deux" 122. I walked back to 122 but it was a doctor's office. I pulled out Earl's phone and searched for "tabac" near "vieux port" the old port. Several popped up and I called one, maybe not the one beside the white church, but in that general vicinity. I sputtered my way through a French phone conversation. Yes, they had the stamps. He would check to see how many. Yes, no problem, but blah, blah, blah. "What?" I asked. "I didn't understand." He repeated and I gathered that I needed cash, no credit cards. "I'm coming," I called into the phone, or maybe I said "I'm coming back," who knows because it was in French. Now, I needed to find a taxi. Enough with walking. I'd already covered more than 8000 steps and it wasn't even 9 a.m. I saw a man striding up the street with a folder under his arm and I called, "Do you know where I can find a taxi?" He kept walking but then stopped and turned around, realizing I was talking to him. My mistake was not saying, "Bonjour, Monsieur," before I addressed him. I told him where I wanted to go and he started to tell me where to go, then suggested I just come along with him since he was headed that way. "But you could take the Metro," he said, "or even walk there, it is only 20 minutes or so." I wanted to scream that I'd been pacing the streets for nearly two hours, but I refrained and walked toward the metro or the taxi that awaited up the street. "Can you make it from here?" he asked as we came upon the Metro entrance. I thanked him and headed down to the subway. Just a few stops later and I emerged into Marseille's old port area. A gorgeous port with sparkling water and lots of good restaurants when one has the time to be a tourist. I typed in the address of the tabac in Earl's phone, but it kept saying a 13 minute walk. I entered another tabac. The man did not have enough stamps for 250. Desperately, I finally flagged down a taxi. "Take me to 4 rue de la Republique," I said. He turned the corner and drove about 20 feet. "It's right here," he said. And just like on The Amazing Race, I said, "Wait for me!" I jumped out of the taxi and ran into the shop. "I'm here for the stamps," I said. He opened his notebook and said, "I don't have enough." Ok. I wanted to call it quits. Earl could leave the country. I was not up to this task or tax. I stood aside but didn't leave as the clerk waited on the next man in line. I didn't understand how he could have told me on the phone he had enough, but now he didn't. "I can sell you what I have, " he said. "90"
So I bought it. One tiny stamp worth 90 Euro. I tucked it in my wallet and ran for the taxi. I was taking a calculated risk that the tabac next to the immigration office still had the 160 stamps it had earlier in the day. The taxi driver wove through the crowded streets, and 16.20 Euros later, pulled up outside the tabac. "I'll get out here," I said paying him and grabbing my bag. I ran into the tabac. "I need 160 timbres fiscaux." The woman counted them out and took my money. My task was completed. 11, 435 steps, about six miles, and I had victoriously gathered the necessary stamps for Earl's visa. I walked to the immigration office and climbed the stairs, settling into the waiting room before Earl came out of the medical exam. I tried to look relaxed, like it hadn't been a big deal for me to chase down those stamps, but my feet are telling a different story. And, yeah, I understand a little better now why all of those contestants are praying, "Oh, please, Lord, let me find it." I'm glad you are in such good shape! And I hope Earl gives you a mighty fine massage -- including your feet! But this is indeed good news. I'll say you have learned trial by fire, to be sure. But three cheers! What?!!! This story is unreal! You are amazing! Oh-la-la! What stress! So glad you managed. Now you're invincible! I hope you had a nice lunch with a view after all that. I don't watch The Amazing Race but my heart was racing for you. Oh my God, Paulita! Quel adventures! You are truly amazing! You proved you have endurance to get the job done! Let us hope that is the last test of that quality!